Thank you Arrow Timber Framing for your expertise, professionalism and creative guidance. 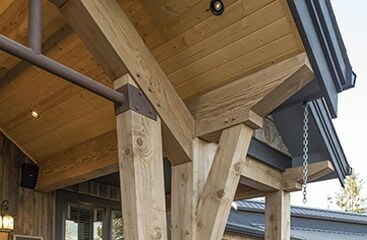 The exposed mortise and tenon style Douglas Fir timbers in our entry, great room, kitchen, hallway and back porch pergola create an inviting, rustic atmosphere, which we enjoy daily. It was awesome working with Bert. He helped us clearly understand our options based upon what we wanted. It was nice to see the steps compartmentalized so we could visualize and make decisions. Bert was exceptional throughout the process. Anyone who sees our entry and back patio will ooooh and ahhhh! We reached out to Arrow during Christmas time and needed it finished a short time frame. Bert and his team got it done quickly and it looks great. I’d recommend them to anybody! Bert used four vertical logs inside the house and that’s kind of unique.The difference on those logs are the two big trusses in the center of the great room. The trusses are not so unique but those logs are..We were fortunate enough to be able to claim these timbers ourselves from the Olympic Peninsula. Bert used four vertical logs inside the house and that’s kind of unique. The difference on those logs are the two big trusses in the center of the great room. The trusses are not so unique but those logs are..We were fortunate enough to be able to claim these timbers ourselves from the Olympic Peninsula. Bert was good enough to let us bring these logs to him and he used those logs not only for these but for the trusses and the entire re-work. We were very pleased to have material that we knew where it came from that’s being used in our home.We were particularly happy when we brought our house design that we had had by a designer who recommended Bert. 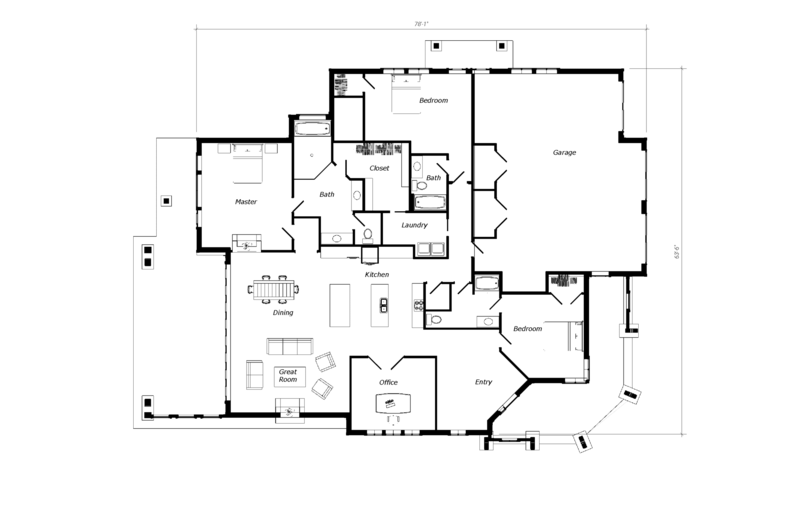 He designed the timbers to go with the house plan we liked so much and we are very impressed with his creative ability and the design he came up with. [After the project was complete] we really needed one more truss outside I called Bert and he looked over the plans and.. quickly designed another truss for over our dining room exterior and just made it really nice because we were trying to watch our dollars, and Bert’s just a master at artistic design.He knows how to get the job done. Bert made a few suggestions to parts of our house’s roof lines that really helped improve the exterior looks. This was outside the scope of work for the timber products. Bert was very attentive to our desired outcome and offered several ideas to make the product attractive. I would recommend ATF to anyone interested in having unique and creative features in their home or other facilities. I also recommend ATF to anyone I know of that is entertaining a project that could use timber features. 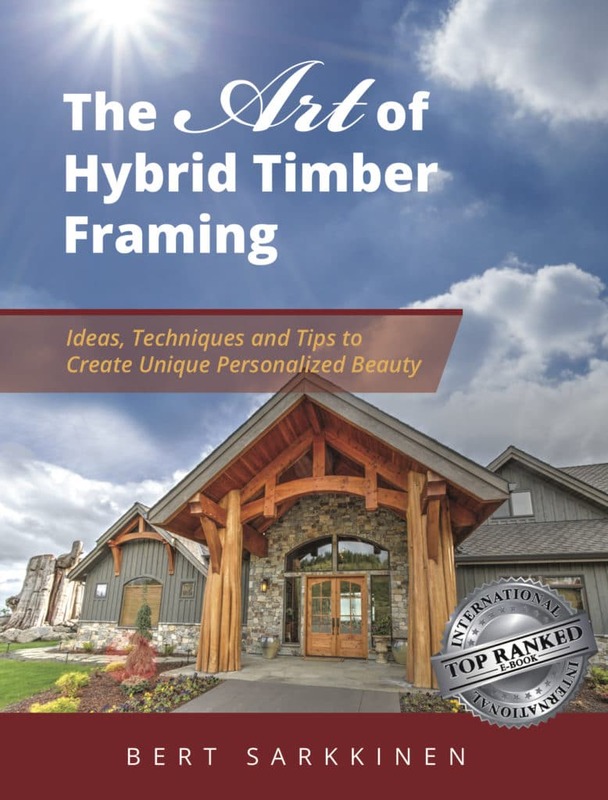 The Timber Living Planning Guide created Bert and Arrow Timber Framing is as remarkable as it is useful. It beautifully represents Bert as a timber frame contractor, and as an artist. This guide helped us identify both our collective style as a family, as well as our purpose for building a new home. The Timber Living Planning Guide created Bert and Arrow Timber Framing is as remarkable as it is useful. It beautifully represents Bert as a timber frame contractor, and as an artist. This guide helped us identify both our collective style as a family, as well as our purpose for building a new home. It has been our privilege and pleasure to work with Bert. We wanted to do something for an entryway but didn’t quite know how. Bert came up with the design. He also helped translate that into beam work over the garage. Bert helped “seed ” our ideas into something bigger – from idea to concept to installation. He made it more comforting for us to say ‘yes’. We wanted to do something for an entryway but didn’t quite know how. Bert came up with the design. He also helped translate that into beam work over the garage. Bert helped “seed ” our ideas into something bigger – from idea to concept to installation. He made it more comforting for us to say ‘yes’. We really admired all the work that was done including the professionalism of the crew. Our backyard pavilion is a work of art. Stunning! Everything just fits! I absolutely love it! I am a customer for life. I just wanted to take a minute to tell you how pleased we are to spend more time in the outdoors! Why we selected Arrow Timber, when comparing quotes – we looked at the four drivers to selecting a builder: Price, quality, schedule, and safety. – Price was in the driver’s seat, but timely completion and quality were significant factors we used to compare builders. Within the “Price” was an element we called price certainty. This was a softer side to the cost evaluation that really speaks to our sense the builder was not going to ‘nickel and dime’ us to complete the project on time and true to vision we discussed. We spent time communicating the end product and did not want to know all the details on how to get there. The ‘nickel and dime’ changes to the price would typically outstrip the cost differentials between builders. – Quality was a strong runner up price. We were naturally driven to the lowest cost, but not at an expense of quality. With Arrow Timber we saw a history of past successes and structures that were built ‘right the first time’. – Safety, as the homeowner there is an exposure to workers injuries. In our discussion with Bert we were satisfied his crews would put safety first. We were very pleased working with Bert & Arrow Timber. Whatever they promised was delivered. That simple. Mark and I have really enjoyed the beautiful covered backyard living space that your team built fast, efficiently and cleanly for our family. During our planning stage Bert was so helpful in helping to give us ideas and we appreciated how he could so expertly draw up a sketch of his ideas. Mark and I have really enjoyed the beautiful covered backyard living space that your team built fast, efficiently and cleanly for our family. During our planning stage Bert was so helpful in helping to give us ideas and we appreciated how he could so expertly draw up a sketch of his ideas. He also used our blueprint to make a second living room. Not only do we spend a lot of our time out back during the summer but we came to realize just how year round accessible it is. This winter we have hosted many family gatherings outback by our warm fire pit. I even put my kids’ sandbox on the patio this winter so they too can enjoy it. Thank you to Bert and his team! I just wanted to thank Arrow Timber Framing for the outstanding job you did on my timber framed pavilion. I cannot tell you how much we enjoy the work of art that you designed, and the craftsmanship that you were able to put into our structure at our home. I just wanted to thank Arrow Timber Framing for the outstanding job you did on my timber framed pavilion. I cannot tell you how much we enjoy the work of art that you designed, and the craftsmanship that you were able to put into our structure at our home. You have a skill that is hard to find these days. In addition, everyone that sees it is amazed at both your design, and your quality. As the owner and a general contractor myself, I must say that working with a company like yours, and the workers you have, is a special treat. I would recommend you to anyone interested in a quality structure with a type of craftsmanship that is difficult to find. They wouldn’t be disappointed! Don’t hesitate to have clients call me or come and see what you are capable of doing for them. I’m sure they will be amazed. We have known Bert for a few years now and have always valued his approach to his work as a fine art instead of just another commonly found step in the construction process. We were interested in building a “hybrid” log-style home incorporating timber features. This is our second home Bert and Arrow Timber have framed for us. From plan review to engineering and foundation, Bert played a key role in making all the pieces fit together seamlessly. Kelvin, Bert’s foreman, was very communicative and adaptive to our needs and had no issues with on-site change orders, as this was a custom home. The neighbors commented to me, that Bert’s crew was clean, professional and as quiet as could be expected. Obviously I can attest to that, they basically left no carbon footprint. I don’t want to leave my home but if I had to build again, Bert and Arrow Timber would be the only crew I would use. For several years Laura and I had been planning and dreaming about expanding our outdoor living area. We have a patio with a concrete slab in the backyard and wanted to come up with some way to put a roof over it and still make it feel very outdoors. For several years Laura and I had been planning and dreaming about expanding our outdoor living area. We have a patio with a concrete slab in the backyard and wanted to come up with some way to put a roof over it and still make it feel very outdoors. We had consulted with several architects and even paid one for several ideas. We were still not real pleased with the compromises and the overall design. At a home show I met Bert and asked him if he was interested. Through that initial meeting I sent him pictures of our house and he offered to come out and present some ideas. In the end were very pleased and proud of the finished work. It is something we love to show off to all our friends. More importantly we are enjoying the space every day. When I get the painting done and some more landscaping I would be glad for you to come and take some pictures. I wouldn’t recommend any other Timber Framer in the county other than Bert and Arrow Timber Framing”. Bert and his team create the most amazing handiwork, I have worked for years with Bert and have discovered he always goes the extra mile with your best interest at heart. Arrow has completed a few Timber structures at our home for my wife Marie and me. We are so happy with his quality of work and value that we are in the planning stages of adding additional structures to our home. We are looking forward to working with Arrow Timber and Bert again this spring! Bert and his Team have completed phase one on our home that is currently under construction. We couldn’t be happier with our decision to go with Arrow Timber. Bert has been so helpful in the design work and so inspiring to us. Bert and his Team have completed phase one on our home that is currently under construction. We couldn’t be happier with our decision to go with Arrow Timber. Bert has been so helpful in the design work and so inspiring to us. It’s like he can see what I have visualized. His crew has great expertise and craftsmanship as they build the most beautiful timbers. They have done what was needed to complete the project, plus more. As funds allow we will move forward with the construction of phase 2 and will definitely be working with Arrow Timber. I wanted to say how much we appreciate your being involved in this project and how happy we are with the work you and your crews have done! It is a dream come true! I hope your crews also enjoyed working on this unique structure and found interacting with it and helping to save it personally enriching. They should be proud! Thank you as well for your incredible generosity, helping to line up donations and also discounting your labor cost. It is more than generous. I know the work you have done is worth much more than even what you did charge, and I appreciate that from the bottom of my heart. I can guarantee that I will be singing Arrow Timber Framing’s praises to anyone and everyone who asks, and I hope the visibility of the barn will bring your company tenfold the business in return. If I had a million dollars, I would give every penny of it to you for what you have done! I would like to put a plaque or sign on the barn with your company’s name and contact information, if that is ok with you. I have had the pleasure of knowing Bert for many years now and let me tell you he is one great guy! I have the utmost respect for him and Arrow Timber. Bert is a phenomenal craftsman, an artist who creates great beauty in his creations. I have had the pleasure of knowing Bert for many years now and let me tell you he is one great guy! I have the utmost respect for him and Arrow Timber. Bert is a phenomenal craftsman, an artist who creates great beauty in his creations. Not only does he have talent but he is extremely loyal and a hard worker. All of the examples that Bert sets are picked up by his hard working crew. As a general contractor myself I’ve had firsthand experience of working on a pool house with Bert and Arrow. From the very start of the planning process to the completion of the framing, Bert put the client’s best interest first and held good on his word. As with any construction project problems do present themselves. Bert handled any issues that arose with dignity and honor, keeping our clients happy throughout. As a business man myself I can attest to that being a difficult task, so I commend Bert. He is the one and only Timber Framer I will recommend or that I will use on future projects. My husband had known how much I enjoyed the look and the atmosphere that timber framing portrays that a few years ago he surprised me with a beautiful new timber framed kitchen. I love the exposed beams and trusses. My husband had known how much I enjoyed the look and the atmosphere that timber framing portrays that a few years ago he surprised me with a beautiful new timber framed kitchen. I love the exposed beams and trusses. They give my house a rustic yet homey and comforting vibe. Bert’s crew expertly and beautifully installed the beams and trusses so quick (one weekend) and efficiently. I know that for any future timber framing we have done, the first person we’ll call is Bert! Thank you Arrow for helping make my house feel like home. Bert is an honest and fair guy. He follows through on his promises and delivers top quality work fast and efficiently. Arrow’s price is money well spent. I would recommend Arrow and Bert to anyone in the Timber Framing Market. Arrow Timber is the Timber Framing company I would refer to anyone. Bert is precise and pays close attention to detail. His guys work hard and don’t stop until the job is perfect. I have great admiration for the craftsmanship that Bert is a master at. Arrow Timber is the Timber Framing company I would refer to anyone. Bert is precise and pays close attention to detail. His guys work hard and don’t stop until the job is perfect. I have great admiration for the craftsmanship that Bert is a master at. They build solid good quality timbers to last a lifetime. quality and you can tell Bert prides himself in his work. We are amazed and very very happy. [We] got right to business with Bert and [he] made a model that helped us fine tune exactly what we wanted. We are amazed and very very happy. [We] got right to business with Bert and [he] made a model that helped us fine tune exactly what we wanted… One of the things I want to mention is that the design was fairly complex and some trouble-shooting issues came up and Bert and Jim [our general contractor] worked together and overcame those issues. We were very fortunate to run into Bert back in 2010. We talked about our dream of owning a home in the country with timber elements to it. I’ve come to realize we’ve hit the sweet spot with the layout of the timbers. We were very fortunate to run into Bert back in 2010. We talked about our dream of owning a home in the country with timber elements to it. I’ve come to realize we’ve hit the sweet spot with the layout of the timbers. Everyone remarks when they come in about how good they feel in their presence. It feels like home to us and it was put together with great love and care. We’re very happy that Arrow Timber framing has done their good work in our home. We met with Bert and looked at pictures and examples, then he drew them up and they all became part of the final design. Bert also added accents, like the mantel, to give it a nice finishing touch. It was a large-scale project with a lot of moving parts and he worked alongside the engineer. Everybody worked hard to get it all done within a very reasonable amount of time. The crew got in and got out. They were very courteous. Everything turned out great. We just love the results. When anybody walks into our home their jaws drop. The crew was great. They cleaned up the area very well, they protected the concrete and they were quick.They showed up on time and they knew their jobs well. From the first glimmer of an idea to the finished product (our cabin) it has been a pleasure to work with Bert and his crew at Arrow Timber Framing. We knew what we had in mind but to actually get it on paper and have a working plan took Bert and his skills with engineering to give us what we were really looking for. Working with the ATF Team, your will receive highest level of support in every phase of the project, from our initial brainstorming session to managing the project through completion. You will experience the rewards of post and beam construction throughout the entire journey. We work relentlessly, like a dog on a bone, to produce exactly the results you expect, so you are completely satisfied with the results. Ready to get started?